It's just the start of February here in Manila but I can already feel the summer heat. Too bad this time, I cant hit the beach. I would be back in Taipei while people here at home will enjoy basking in the scorching heat of the sun and swimming in the cool waves of the glorious fine white sand beaches. But I'm still enjoying the heat here. I missed this kind of heat, but not the pollution and traffic, factors which I think contributed to the "carry on" of my winter breakouts. I was in and out of my ever trusted dermatologist's clinic, after almost five months of not seeing her. She prescribed me with a helluva expensive antibacterial capsule (called Tetralysal created by the skincare demigods of Galderma) to stop my glands from producing yucky acne. I can actually feel it working in my third day of taking it. No more new ones popping out. 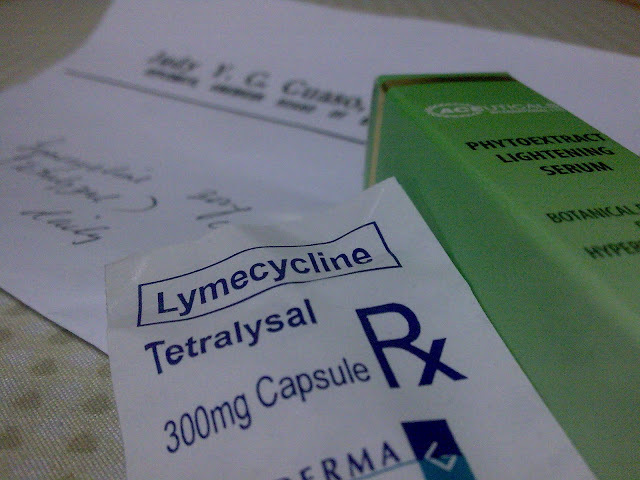 Aside from the oral medication, I also have serum and a topical medication in the form of erythromycin & clindamycin cream. Crossing my fingers! Will go back again next week, hoping that my skin will clear up just before spring season starts. So aside from my "winter break-out", I'm just basically updating because I've got plenty of time to waste. I was with my good friend Ariane this afternoon for lunch. We talked about life, as usual. It will always be an endless discussion of what to do, where to go. But to wrap up everything, we'll always say, "We'll get there."